and the plate for all the connections for air and light ,7 infact. al the connection are made,exept the air supply,if i place that one, the axle will be lifted ,and i can't go further.the friction will be to big to close the chassis. 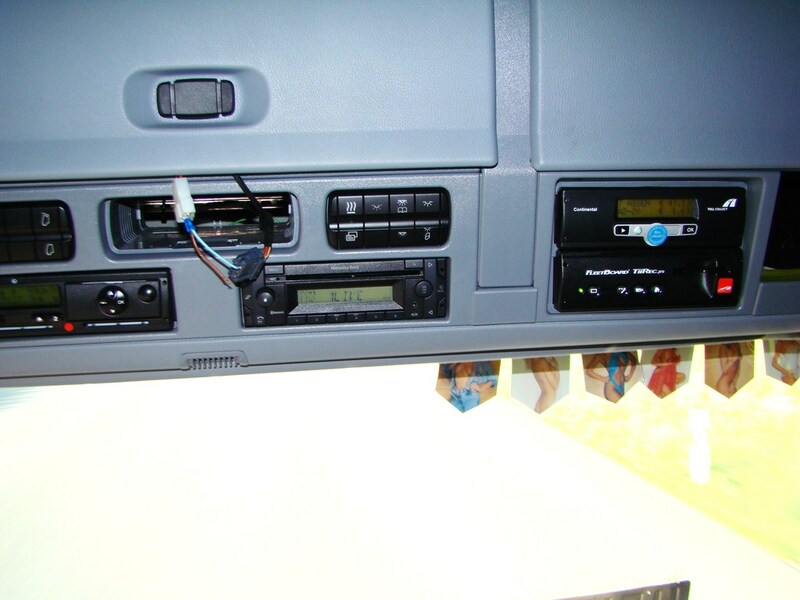 air supply is connected,pump air over (it's a 8 years old chassis,so there are qiute some air leaks,got him new,a few weeks before i got my DAF ,which can be seen in post 1.) to the rear part. did you remember the licensce plate? freightletters are signed, axles are lifted,ready to cruise again. when a company have more of these chassis,he can swith them,but it's not allowed. Last edited by janihudi; August 13th, 2011, 17:31. Thanks a lot, this was very interesting. Specially the explanation of the trailer, now I've learned a lot. you're welcome,there are btw several types of those trailers. before this one i had a 5axle trailer,2 axles at the front part. Hey, Janihudi. This was a great explanation!! This is a quite clever construction, but so complicated, that German authorities will neyer allow it here!! 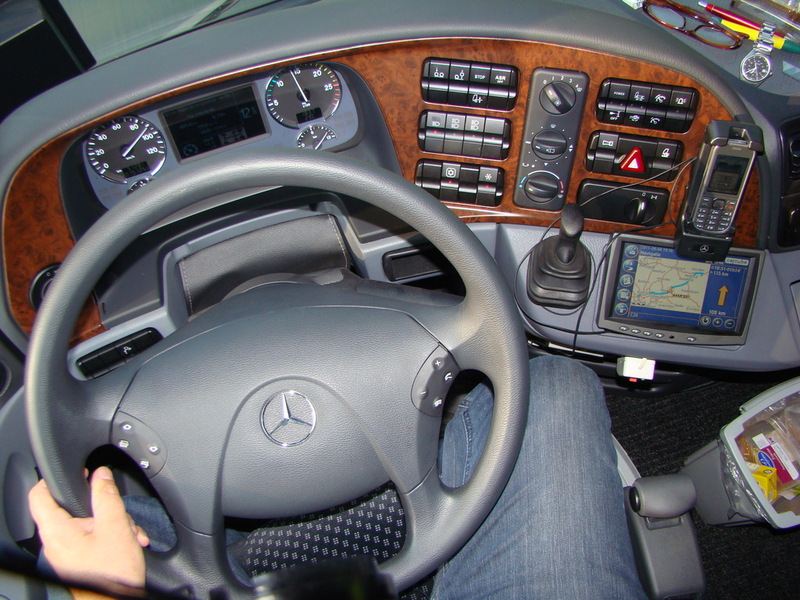 The interior of the MB looks quite similar to your Opel, so MB changed the design a lot - in my opinion!! there are german transporting companies who drives with them,even one that is a carter for us. they had made a long time troubbles with it,that you have 2 license plates on a trailer,so i had to cover the frontpart when i go to germany. now it's oke to drive without a cover. the designer is a dutch guy,buyed away from DAF,he has drawn the new axtros aswel that weird looking unimog. 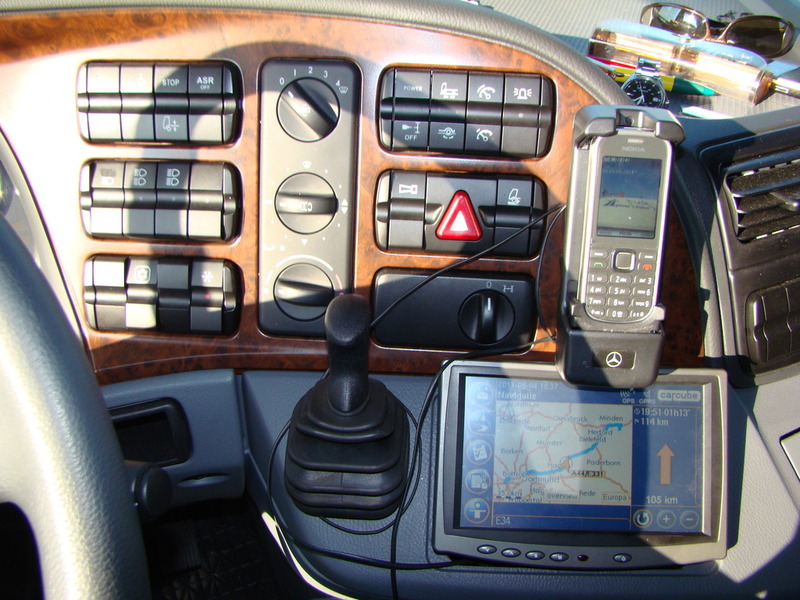 it is easier to drive 10 hours in a truck then 5 hours in a car. the problem with this here is that germany just allowed 40 tons,while we here in holland have 50 tons limited. this concept will do for germany, if you load toiletpaper, chips and other leight stuff. but you may load as much as you want,until the police gets you,then you have a problem. but there are also 8 axles trucks with this concept. On the trip to Ely yesterday I was truck watching, something I always used to do on the B.u.n.g.a.y Soc. trips but simply because I liked to see from where they came, particularly if from overseas. But yesterday it was the axle configuration I was after, having got my head around most of your explanations on this thread. After you get west of Bury St. Edmunds on the A14 it's dual carriageway and then a long stretch of 3-lane highway till the A11(M11) (London bound) junction is reached, after which it reverts to dual. So that middle section is heavily trafficked. Plenty trucks including quite a few Mercs. Thijs, looking at your images of the models I think most of the larger trucks of all types were tractors with trailer as in at #42.2 Their axle configuration was mostly 1(cab), 2(1st container front) and 3(2nd container rear), sometimes 1-1-3 The three rear ones were close together without the space between the last two. Any particular reason for that space in your Merc? 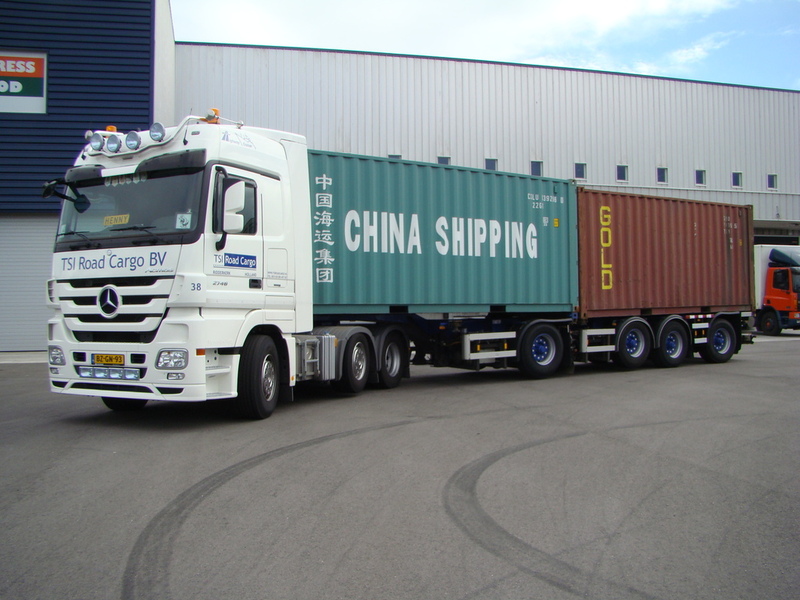 Also, you say that when there are no containers then you drive on only 1, 3 and 6. But that gives you no steered axle after the cab one. Doesn't that present problems on cornering? Last edited by wherrygirl; August 26th, 2011, 13:30.
they told me in the 80ties that the more axles in the uk ,the less you pay for roadtax. 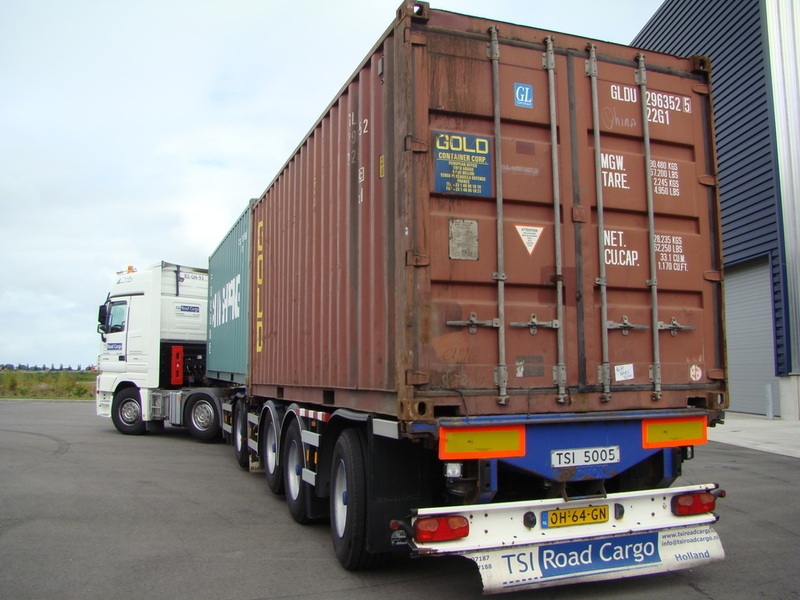 in those years i was driving with ferry trailers we may load a 23 ton netto for the uk,but only when we have a 3 axle trailer,while we were dooing it with a 2 axle truck. that theird axle was just to bring the weight over more wheels on the road,so that the road won't damaged. but we are placing that third axle infront of the traction axle (most of the trucks) and making it a steering axle the british made a liftaxle and place it as last axle. if there was a 1-1-3 truck,then they don't load have goods,patoto chips,toilet paper,and more of this light stuff. 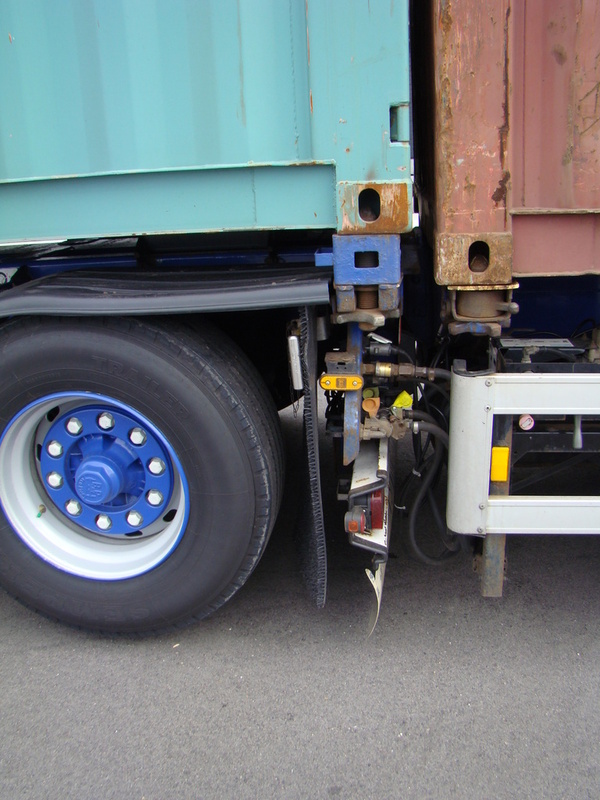 the raison of the space between the last axles is of the steering axle. when you turn the wheel the tyre heel on the outside is gooig to the front when turning in, while at the backside the inside heel is gooing furher back. so try this at your car. now turn your wheel a about half way to the right a see howmany space there is now between the wheel and the car. measure this at the heel ,there were the side of the tyre goos to the tread profile. 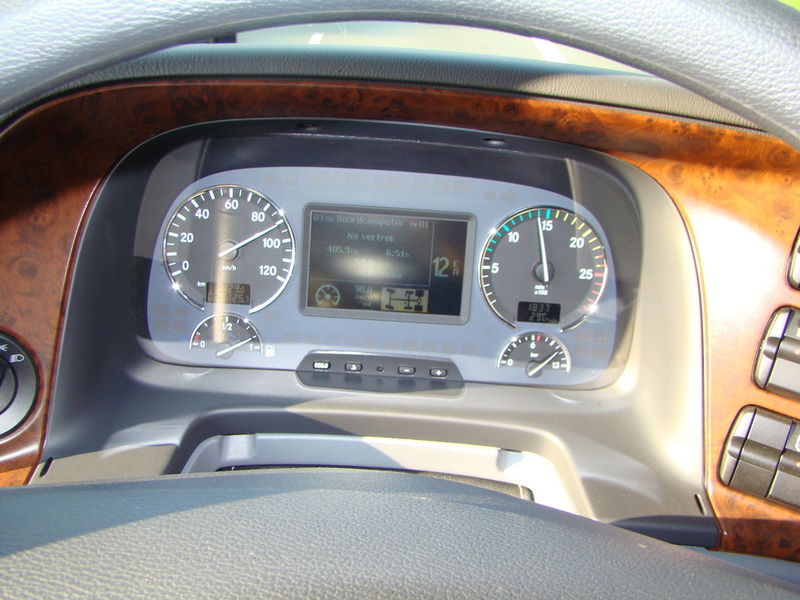 about your steering quistion when driving on 1 -3 -6 there is no problem. the cab is steering the rest is following,the trailer wil come inside the corner,but nothing to worry about. in 45.2 you see the 2 holes were the pin can go in,these are the customs and 45 ft container locks,why 2??? don't know. and when he is on place about 5 cm is coming out of the chassis . so gooing through the male and female parts,just like a big piercing. 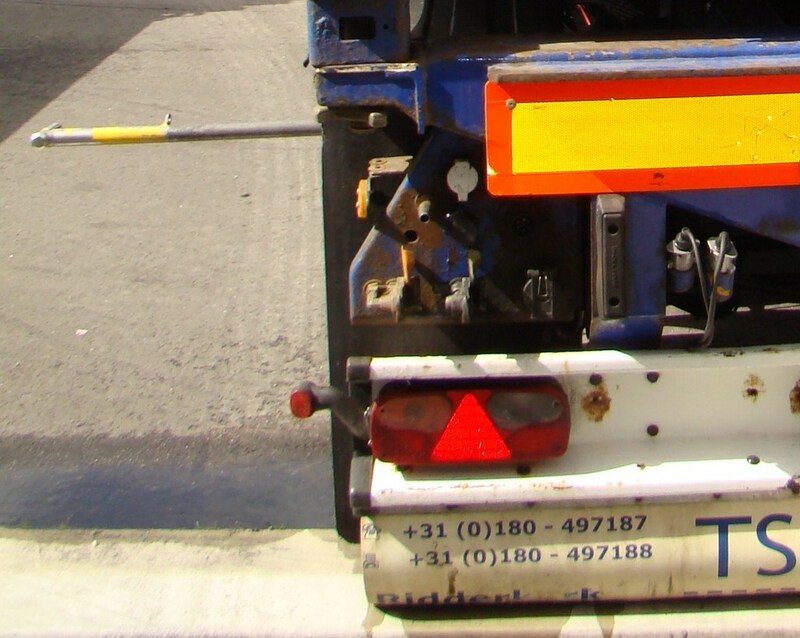 raison of the space between the last axles is of the steering axle. you can forget this part,i was more refering to the space between tyre and mudflaps,i thought about this while gooing to bed. 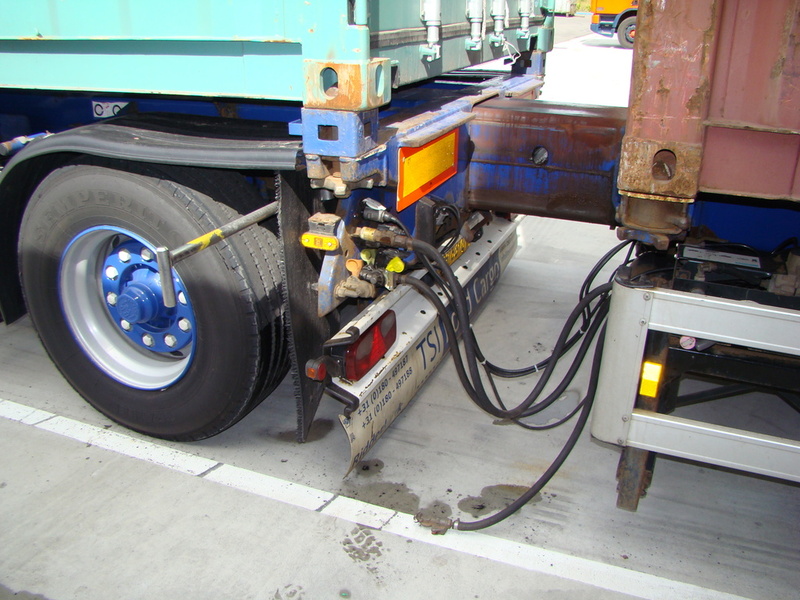 the reason of the space between hose last 2 axles is for spreading the weight. axles that stands further from each other may carry more loads then when they are close at eachother. but when they ar far from each other then they will get very diffecult around a corner,thatswhy mine chassis has a steering axle at the back,he steers the chassis to the outside corner,but i have just friction on 2 (axle 5 and6) 4 tyres while axle 4 is rolling to the inside corner,so these 2 axles helps rounding corners,but they are just following,i can't steer them manual. i can block them,and the steering function will blocked automaticly when the gearbox shift in return. another +point of this wide spread axles is that i don't need a second leg,as at the frontside,on the backside. ,thats also the reason of the leg at the front,that he wont tip over at the front. with the weight problems (every company won't to take more and more) we have Weighing loops,and there will be more and more of them. and this al in just a few seconds. the computer show that one is to heave,the police bike or car who is waiting a few kilometers further pick you up and brings you to a weightbridge. so the more axles you have the smaller the change is that you are overloaded at a axle. sometimes i am overloaded but thanks of al the axles i am not overloaded on the axles ,but will exceed the max load of 50 tons. and those tickets are cheaper than overloaded axles. Thijs, this is just a quickie as I can't stop long enough to study your last answer thoroughly right now - will do so later today. Your first reply made sense as you explained it so I didn't go out to test it on my car, but it immediately led me to wondering why that space was not on the trucks I saw, where all 3 rear axles were close together, as in the model I quoted. Also, looking at your Highway Cruiser it did seem a very large space just to accommodate the turning of the rear steering wheels. So there were more questions coming. You are good to go into such detail for me, I appreciate it, and as for the language problem - well, you make the explanations very clear even though it must be a tedious job getting it into English. This is why I appreciate it, you don't just fob me off with a quick answer.